Homeless, unwed mother and former foster child Jamillah with her three month old son at Raphael’s Life House, transitional housing for homeless, pregnant women and babies, when born. Made my first trip to Raphael’s Life House, transitional housing for homeless, pregnant women and their babies. 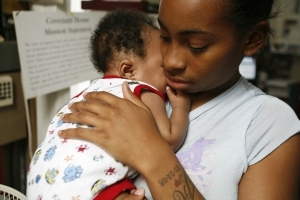 MEET Jamillah Williams and her three month old son, who has been living at Raphael’s Life House for several months. She’s unclear as to whether she was ever “legally free” for adoption. She “aged out” of foster care although has not signed herself out of the dyfs system ensuring her services until she’s 21 years old. She seems to be advocating for herself in terms of receiving services. She has a CASA – court appointed special advocate – who she calls for legal advice but says that no dyfs worker has ever advised her as to any service or assistance that might be available to her. One of the really interesting parts of the three hour audio taped interview was learning about how foster and homeless kids communicate with each other. My Space seems to be a lifeline. They used it to keep in touch with biological family members as well as other foster kids they meet as they move from home to home. Somehow they seem to always have internet access and utilized My Space as a way of updating each other. Many also have cell phones cards with minutes to use the phone since they have no credit and cannot get an account. I need to explore the whole idea of using My Space to track each other.